JimBoylan wrote: Listings in the Official Guide of the Railways are really paid ads. The DL&W wasn't the only road to economize by omitting or condensing some schedules submitted to the Guide. D'oh! That's why one needs to read the "Additional Trains" fine print below the M&E schedule in the OGR I linked to -- it lists 11 trains from South Orange and 9 to South Orange. At least now I know why there was a yard in South Orange, and why it was abandoned around 1970. In looking at the tower picture supplied by JasW, the tracks in the foreground went to the George G. Salmon Lumber Company. There was a switch just beyond the tower (this is on the side of the tower opposite the yard, and I remember that the ties were buried in mud). One spur went to a coal trestle, and the other to a lumber shed. For you folks with the timetables, I've got a question: In the early '60's there was a GP7 that would come by the tower at about 3:30PM with a few coaches, a baggage car and an observation car (in that order!). I believe it was named X-61 or X-63 or something. It made no station stops. Can anyone tell me what it was for? rails2 wrote: I have DL&W blueprints of the yard and surrounding area, dated 1961, and the "building" is not shown. The blueprint covers from about First Street to just short of Maplewood station. If I recall correctly, it was only part of a building--maybe only 1 wall and a corner, with a turntable in front of it. Thanks for posting the pix. I've been scouring the web looking for pictures to go with the blueprint. If anyone knows where there are pictures of the nearby pump house spur, I'd be really interested in seeing them. The end of the spur had the rails bent UP in a semicircle. Not something you see every day. I got thinking about this thread and realized that the reason for the South Orange trains was primarily to allow for local service to South Orange with other trains running as expresses on the middle track during rush hour times. The expresses would generally skip all stations between Hoboken and all points east of South Orange. During the 50s and early 60s, afternoon commuter runs would be leaving Hoboken every couple of minutes--locals interspersed with expresses/limited stops train running hot past South Orange. Need to do more research in the ETTs but I bet I find trains that ran express to Summit and thenfinished their runs as locals to Gladstone and Dover.
" Need to do more research in the ETTs but I bet I find trains that ran express to Summit and thenfinished their runs as locals to Gladstone and Dover. " 3- Gladstone Branch trains predominately express from Hoboken to Summit then local out to Gladstone. Some GB trains made 2-3 stops East of Summit ( typically Short Hills, Millburn and/or Maplewood ). There were 1or2 GB trains that ran express to either Gillette or Stirling - can't recall which - then local to Gladstone. 4- Morristown/Dover bound trains ran local to each. AIR, there were 4-5 rush-hour trains that terminated at Morristown and slept in the MU yard there as well as over weekends. Not old/aware enough to recall the active use of the South Orange MU yard. My guess is trains were locals to/from Hoboken. BTW, 3-4 MU sets slept in Summit yard nightly as well as over the weekends. Same was true at Montclair Terminal on the Montclair Branch where MU sets slept nightly and over weekends on track #'s 3-4 and 5. The latter ended in/around 1964-66 sometime when trains returned to Hoboken to sleep. I believe this only occurred non-rush hour and/or on weekends in this era, but a number of Gladstone Branch trains simply began/ended their run at Summit. They (or at least the eastbound ones) arrived in Summit on the southernmost track against the wall (on the far left in the early 70s photo below), and passengers changed to the eastbound M&E local on the middle track across the platform. Passengers heading west on the Gladstone at these times debarked from the M&E local on the northernmost track (the fully visible one in the photo) and crossed over to the wall track via the station overpass. I think some of the MUs in the Summit mini-yard were Gladstone trains.
" It was an engine house, which makes sense given that there was an adjacent turntable: "
I'm told off-line we're both wrong on that building. It's been identified as an 'oil house'. Apparantly these type structures elsewhere around the system were near turntables/roundhouses within yards. They all lacked few if any windows and all were brick to avoid fires if/when(?) the oil stores ignited.
" If anyone knows where there are pictures of the nearby pump house spur, I'd be really interested in seeing them. The end of the spur had the rails bent UP in a semicircle. Not something you see every day. " Presume you're referencing the spur/structure that was (is ?) just West of the yard back in 'the woods' ? After some zooming and dragging, that building is still there with what appears to be an intack elevated track similar to a coal dock. BTW, those curled-up end rails are STILL in place at 3-4 old siding remnants East of here thru Orange and East Orange. Interesting. I only relayed the description of the structure as an engine house from the site (viewoftheblue.com) hosting the pictures. It does look less than long enough to hold an engine, assuming there were doors for an engine on the far, south side not visible (which would also presuppose the turntable being on that side, too, obviously, and I have no idea where the remains of the turntable in the photo are in relation to the structure). There's a DL&W oil house in Steamtown, but it looks nothing like this. Not that I have any idea what one is supposed to look like. Even if you could find the Turntable remains, they've probably been either a) built over or b) decrepit in the woods so far and overgrown. They were decrepit remains when the above photo was taken 40 years ago! Where the turntable and oil house were located is now in an outfield of a complex of baseball diamonds. 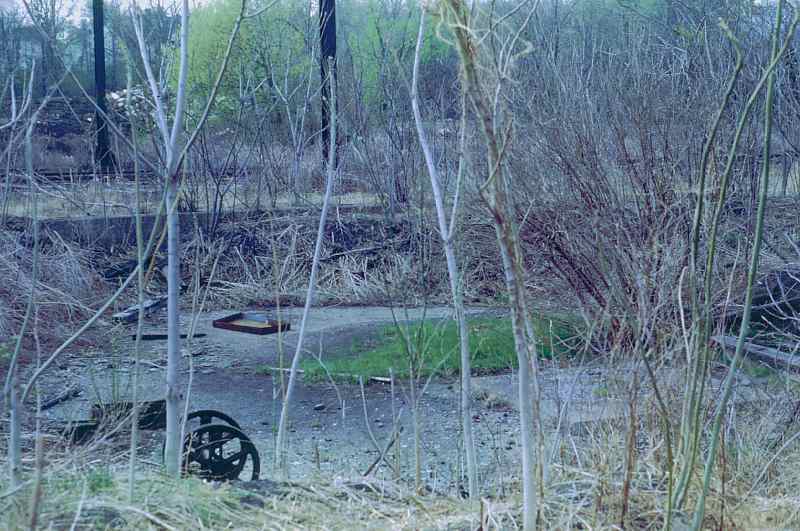 Looking at the turntable picture, it now seems obvious that it was located off to the left of the oil house in the photo -- you can see the yard tracks behind the turntable remains, while the oil house was pretty hard by the main line tracks. So no way could it have been an engine house. BTW, apparently the Incredible Hulk found himself in that oil house and busted out. Thanks for posting the link for the pump house spur next to the yard, but the close-up now has trees obscuring the view. Interesting that the rails are still there. The spur was just to the southwest of the yard, and served the pump house for the village artesian wells. It had a coal dock. Found a map showing the turntable and 'oil house' .. Go to historicaerials.com, type in "lackawanna pl., south orange, nj" and go to the 1954 aerial. Move map up a bit and you can clearly see both. Seems that even by 1954 both had been abandoned. Anyone know when either were last used? Also a good map from 1904 at http://www.historicmapworks.com/Map/US/ ... ew+Jersey/ Which shows the yard, turntable and what distinctly looks like a round house at the east north east side of the TT. Looks like the SO yard had eight tracks at one time in the past? 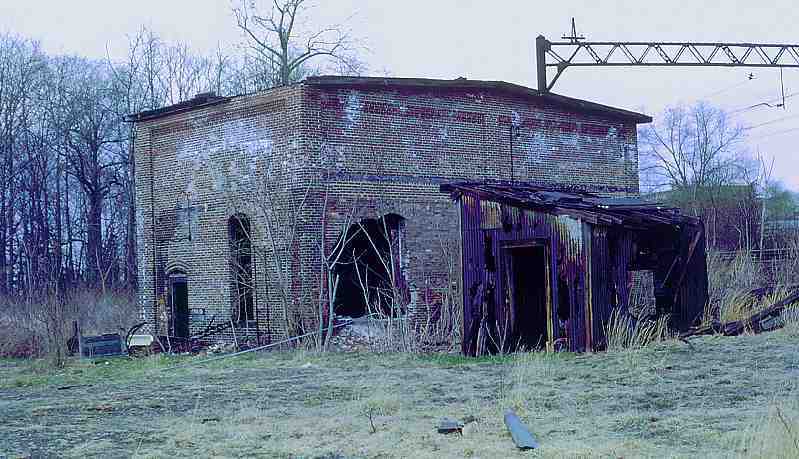 The oil house at Gladstone still stands, just east of the grade crossing. When built it was behind the former engine house. Now used as a place to store sand for the two push pull outfits at the yard. CarterB wrote: Found a map showing the turntable and 'oil house' .. Go to historicaerials.com, type in "lackawanna pl., south orange, nj" and go to the 1954 aerial. Move map up a bit and you can clearly see both. Seems that even by 1954 both had been abandoned. I would guess there wasn't much use after electrification in 1930. Although if you look closely at the 1931 historicaerials.com shot, there definitely seems to be something on the turntable -- you can see what I would imagine is an engine and its much more obvious shadow.